How much of a risk are you willing to take on behalf of your faith? Have you ever considered that it’s necessary to take risks? Surely God doesn’t expect us to take risks! Or does he? May I speak and may you hear through the grace of our Lord; Father, Son and Holy Spirit, Amen. I wonder, what’s the biggest risk you’ve ever taken? I could throw in a few example to make you think, ooh yes that’s a risky thing to have done; you might say I took a real risk when I did that; or maybe you don’t take risks because you always weigh up the chances of failure and success and stick with the greater odds of success. After all taking risks is a risky business – it can involve an exposure to danger, the possibility of something unpleasant or unwelcome happening; the probability of financial loss or the chance of incurring unfortunate consequences by engaging in that particular action. The fact is behaviour psychologists have proved that as human beings we are generally adverse to anything that involves a risk – people will prefer not to take a risk even at the cost of letting valuable opportunities pass by. In today’s gospel we have the example of three slaves or servants and their attitudes to risk. The first two felt able to take a risk, but then it wasn’t their money they were taking a risk with but the third one started to analyse what the risks were and decided to do nothing, not even the soft option of putting it into no-risk low interest bank account. He calculated the possibility, the probability and chance and decided they were too great for him, and it seemed he made the wrong choice. Our lives are full of opportunities to take risks, especially where our faith is concerned. I cannot speak for all of you whether you have taken risks on your journeys of faith. Maybe you’re like I was just beginning to dare to put your foot through the door because you want to find out what it is that’s calling you to be here. Or maybe you’ve accepted the invitation and want to know what God might be asking you to do next. For me one of the risks was stepping into the unknown, with no church background or experience, a painful sense of not wanting to step into an arena in which I could be scrutinised and found to be wanting and yet a deep desire to put myself forward despite all of this. You may have heard me say before, but it was reading John Ortberg’s book, ‘If You Want To Walk On Water You Have To Get Out Of The Boat’, which was the catalyst that made me take a risk to get where I am today; and I would suggest that every Christian’s life is marked by windows of opportunity that demand a radical step of faith in order to follow Christ and fulfil his agenda for their lives. The reason it’s radical is because you say to yourself, ‘If this doesn’t work out, this relationship could fall apart. If I do that, I could be changing my family dynamics, it may ruin my career possibilities in the future, or what if I can’t pay my bills?’ When we are facing a challenge and the possibility of failing, our mind rationalises our fears by coming up with hundreds of logical reasons not to do it. But, where there is no risk, there is no faith. Just like the third servant had no faith in the master. Without faith there is no power and where there is no faith, there is no joy, no reward, no pleasing of God. In fact, where there is no faith, what you do get is hollow religious activity, moralistic rules, and dead orthodoxy. We all know of churches where despite the God talk and the many programmes and course that are run, over time it becomes religious activity and the focus is on, ‘Do this but don’t do that’ Lots of rules and the wrong sort of power. Where though is the presence of God? We know that when we have great faith we are able to do great things. We only have to think about all the people throughout the history of the bible such Moses, Esther, David, Peter or Paul, God brought windows of opportunity and each one of them took a radical step of faith. And that radical step of faith meant that if God didn’t show up then Peter was going to fall through the waves or Paul, when he returned after persecuting the Church, was going to die. Every person’s life that is greatly used by God, that experiences God in powerful ways, takes great risks. When we have great faith we are able to do great things. We can think great thoughts; we can pray great prayers and dream great dreams. We’re not just talking about calculated risks, because let’s face it we all like opportunities that come with the word ‘guarantee’ attached to them. That way we feel safe and satisfied with our decisions. I can think back to the time when I told people I was going to go skydiving and people were worried about the risks, but it was a calculated risk, the equipment was checked, the experts had done it thousands of times before, the step I took to allow myself the liberating and exciting feeling of flying into the vast chasm of the sky had been carefully weighed. Not a bad view from up here! However, one thing that risk takers have in common is fear; fear of what might happen. Those emotions that you feel and think, risk takers all have as well, they fear what might happen. I can tell you, at least my own personal experience, the greatest steps of faith I’ve ever taken I was scared to death, and it’s okay to be afraid. It’s not okay to allow your fear to paralyze you from taking the step of faith. But you have to have faith to step out in spite of your fear. God tells us time and time again, ‘Do not fear, do not be afraid, I am with you’, and he equips us as we heard today; ‘put on the breastplate of faith and love, and for a helmet the hope of salvation. For God has destined us not for wrath but for obtaining salvation through our Lord Jesus Christ, who died for us’. The other day I came back from our study group quite buzzing. There had been a sense of excitement, a desire to engage with new ideas, of wanting to do something. We’ve been studying John Pritchard’s book, ‘Ten Reasons why Christianity makes Sense’ and we’ve talked about reasons why we should believe in God, the problems people have with faith, how to enliven our faith and the values we need for the church of today and tomorrow. Above all the need to be communities where a holy fire and passion burns fiercely at its centre because this is what attracts people. We have to take risks, but as we’ve said risk looks very different in different people’s lives. Often when we think of risk or faith, we always think it’s stepping out. Yes, sometimes we need to leave things behind and sometimes we need to remain and get stuck in to confront and change things, it’s still stepping out – of the security of our comfort zones. The good thing is sometimes even if you take a risk and fail, you end up winning anyway, because you learn valuable lessons in the process and stretch your abilities. There is a certain satisfaction in knowing that you dared and went for your dream against all odds, whether you succeeded or not. Regret of never trying is usually much harder to live with than failure. This entry was posted in Ministry and tagged calculated risk, change, comfort zone, faith, fear, follow me, God, Holy Fire, John Pritchard, Passion, risk, Ten Reasons Why Christianity Makes Sense on November 19, 2017 by lindasgalvin. Why are you so full of heaviness, O my soul, • and why are you so disquieted within me? Just lately I have been feeling really unsettled and I just can’t put my finger on it. On the surface nothing has obviously happened that might cause this feeling of unrest; in fact things have been falling into place and my self-confidence has been gradually increasing – but still there is a feeling of general unease. Obviously, looking back there are many changes that have taken place in my life over the last few months; the excitement and nervousness about starting college; learning how to split my week between study and wanting to continue to serve my home church; as well as pulling back on some of my voluntary commitments. Alongside these, in my personal life, I have been rediscovering what it means to be part of a married couple, now that the girls have left home and are more or less independent. You might say that change is actually only the events or things that we either choose or have thrust upon us, which will have an effect on us in some way. What comes out of those changes is transformation, because we will never be the same and we can never go back to being the person we were before. This can apply to so many life events, but a vivid example, where this is clearly apparent is where death and loss are concerned. Mags Blackie in a recent post, spoke about Kay Warren, an American pastor’s wife and her family’s emotional journey through grief, following the suicide of her son. There was an expectation from people around them, that life would eventually get back to ‘normal’. However, Kay’s observation was that her true friends recognised that this wasn’t going to happen, ‘they don’t pressure their friend to be the old familiar person they’re used to; they’re willing to accept that things are different’. Clearly this and similar events involve huge and uncomfortable changes and where our faith is concerned, those changes might not on the surface be so obvious. If we were to look to biblical times, there are many more examples where ordinary people have come into contact with God and the changes that that entailed transformed them and their lives forever. We can think of Peter, who after meeting Jesus, was transformed from a humble fisherman to a leader of Christ’s church; or Mary Magdalene, a woman with a troubled past, but who’s devotion to Jesus transformed her into the one who was trusted to reveal his resurrection to the other apostles. Yet none of these things happened overnight, it was something that occurred gradually, and whilst it was emerging there would often be a period when they were in a state of flux – uncertain of what was to be done but aware that it preceded a new direction for their lives. What I am certain of is that no-one once they have come into contact with God, as creator, redeemer or sustainer can remain unchanged. So if you too are seeing changes in your lives and are feeling uncomfortable or unsure about it – just hold on in there, for all will eventually be revealed. This entry was posted in Ministry and tagged change, faith, God, Jesus, Mary Magdalene, Peter, Psalm 42, state of flux, transformation on March 16, 2014 by lindasgalvin. Pivotal Moments and the Parable of the Lobster! In life, there are key moments that are scattered along our timelines. Moments that stand out and are remembered as pivotal. Some of them are more general – like birthdays, weddings, the bearing of children… others are personal – times when something has happened that has taken us in a new direction and changed our lives. Sometimes the change has been welcomed and sometimes it has been scary and uncomfortable. Sometimes we’ve been able to avoid it altogether by simply refusing to acknowledge that there is any need for change. So at church today, at what would be one of those pivotal moments in my life, I thought my talk could revolve around that topic. All church congregations can become complacent from time to time -or maybe it’s just our particular brand of Anglicanism? We know what is going to happen each week, so we turn up with two or three minutes to spare; find our usual seat; exchange brief pleasantries with the people in the pews in front or behind us; offer a quick arrow prayer that the service will not take too long as we have visitors coming for lunch; settle down to say those well-worn and comfortable words of the liturgy and hope we won’t make it obvious if we go off into a daydream during the sermon….. I warned them…. I really did! I warned them that some of them weren’t going to like it; some of them would be happy to do it but that some of them would have a little moan about it. However, that they were to moan to me afterwards and not amongst themselves! Narrator: Long ago, when the world was very new – there was a certain lobster who determined that the Creator had made a mistake. So he set up an appointment to discuss the matter. Lobster: With all due respect, I wish to complain about the way you designed my shell. You see, I just get used to one outer casing, when I’ve got to shed it for another. Very inconvenient and rather a waste of time. Creator: I see. But do you realise that it is the giving up of one shell that allows you to grow into another? Lobster: But I like myself just the way I am! Creator: Your mind’s made up? Creator: Very well, from now on your shell will not change . . . and you may go about your business just as you are right now. Narrator: At first the lobster was very content wearing the same old shell. But as time passed he found that his once light and comfortable shell was becoming quite heavy and tight. After a while, in fact, the shell became so cumbersome that the lobster couldn’t feel anything at all outside himself. As a result, he was constantly bumping into others. Finally it got to the point where he could hardly even breathe. With great effort he lumbered back to his Creator. Lobster: With all due respect (sighing), contrary to what you promised, my shell has not remained the same. It keeps shrinking. Creator: Not at all (smiling). Your shell may have gotten a little thicker with age, but it has remained the same size. What happened is that you have changed – inside, beneath your shell. You see, everything changes – continuously. No one remains the same. That’s the way I’ve designed things. And the wisest choice is to shed your old shell as you grow. Lobster: I see, but you must admit it is occasionally inconvenient and a bit uncomfortable. Creator: Yes, but remember – all growth carries with it both the possibility of discomfort . . . and the potential for great joy as you discover new parts of yourself. After all, you can’t have one without the other. Creator: If you like, I’ll tell you something more. But what if God were to change those plans? How would you react? How is he going to shape us so that we can be a blessing in the world, so that we can move out into the world as kinder, gentler people filled with power and filled with strength? Those plans we made may have to change, but instead of trying to predict how it will affect us far into the future maybe we should think of it simply as what is the next thing that God wants us to do on our journey with him and how are we to do it. Is it to get up and change a particular aspect of your life; is it to go on a walk and spend some time with God; is it to do something radical – to say here I am God? As I mentioned earlier, from a personal point of view, today I am at one of those pivotal moments. 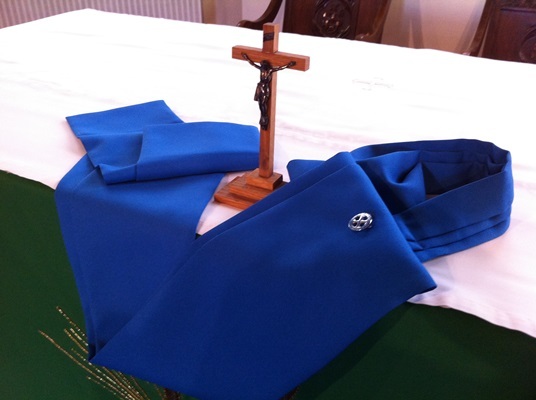 At the end of the service I ‘laid down’ my scarf as a Lay Reader in preparation of the move into the new phase of my ministry as an Ordinand. To reach this point there have been many changes in my life – some filled with utter joy and some filled with utter despair. What I do know is that I haven’t faced it alone because God has met me in the change and has given me a lot of wonderful people to walk alongside me – and most of them were sitting there right in front of me at church. This entry was posted in Ministry and tagged Anglicanism, Apocrypha, Bob Goff, change, God, Gospel, Jesus, Lobster, new direction, ordinand, parable, Reader, Steve Weins on August 18, 2013 by lindasgalvin. This got me thinking about the moments when you suddenly realise and have the courage to do something which could potentially change your life. Like Peter, my initial timid attempts did not automatically result in remaining on top of the waves. It took a lot of sinking and bobbing until I understood that it was having faith to attempt the act itself that would keep me upright on the water, not doubting my ability to actually do it. 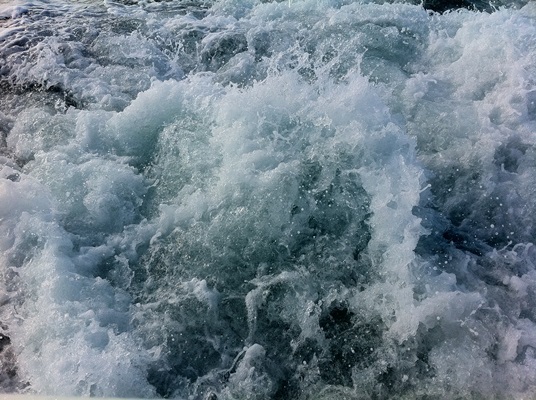 This entry was posted in Ministry and tagged change, comfort zone, courage, John Ortberg, life changing, Mission to Seafarers, Sea Sunday, walk on water, water on July 14, 2013 by lindasgalvin.